We can’t always control what we’re exposed to, but we can take charge of our health by eating the foods that fortify our immune system, especially during cold and flu season. In addition to staying on top of fundamental immune-boosting habits like getting enough sleep, washing our hands, managing stress effectively and incorporating regular exercise, stocking the fridge and pantry with the right foods and supplements can strengthen our germ-fighting. As you make your next grocery list, consider stocking up on the following foods and supplements. Chicken soup. It’s not grandma’s remedy for nothing: Chicken soup has been shown to help reduce inflammation associated with viruses. It’s also hydrating, with the warm liquid helping to loosen congestion and reduce upper respiratory cold symptoms. It’s not clear exactly what it is about chicken soup that provides the benefit. It’s likely that the collagen-rich broth – like what’s found in slow-cooked homemade chicken soup – plays a key role. If you’re opting for store-bought chicken soup instead of simmering your own for hours, try adding bone broth to it for more nutrition and protein. 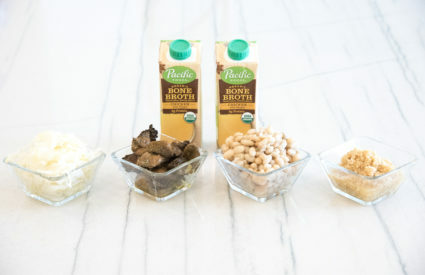 Bone broth is made by simmering animal bones for hours so that more nutrients, including collagen, are pulled into the broth. Tea. Green tea, as well as black and white teas, are packed with antioxidants called flavonoids. Green and white teas are also particularly rich in epigallocatechin gallate, or EGCG, a particularly potent antioxidant that has been shown to enhance immune function. Shellfish. Shrimp and oysters to fend off the flu? It’s not what we typically first think of, but shellfish is one of the top food sources of zinc, which may help reduce the severity of a cold and clear it up faster. Brazil nuts. Research has shown that consuming 300 micrograms of selenium daily can help to strengthen the immune system – a dosage easily obtained from just three Brazil nuts. Other selenium-rich foods include lobster, oysters, crabs and tuna. Turmeric. The bright yellow spice is a natural anti-inflammatory, potentially helping to relieve symptoms like sore throat and achy joints. Add turmeric to sauces, proteins, and vegetables, or consider adding a turmeric supplement. (Tip: Look for turmeric supplements that also contain black pepper, which enhances our body’s absorption and utilization of the active compounds in turmeric). Ginger. 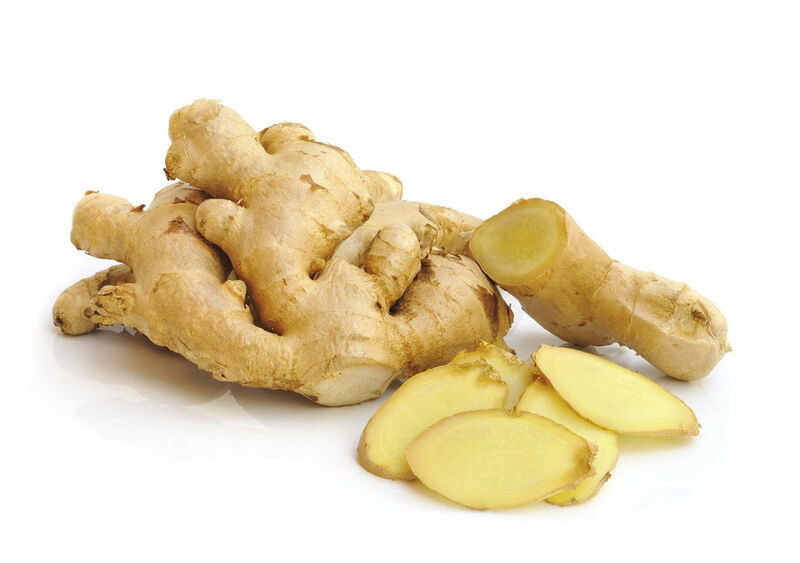 Rich in a compound called gingerol that provides its natural heat, ginger can help decrease inflammation, which in turn can improve cold issues like sore throat, nasal congestion and nausea. To reap the benefits, steep freshly grated ginger in hot water, or add an ounce of fresh-pressed ginger juice, which can be purchased online or at local juice bars, to hot tea or smoothies. Garlic. It contains allicin, pungent compounds that appear to help fight infection and boost our immune system. Garlic might also reduce the frequency and number of colds we experience, but many of the studies have used a concentrated extract providing the equivalent of 20-plus cloves of garlic. While adding garlic (and allicin-rich onions and leeks) may have some benefit, we’re far more likely to reap garlic’s cold-fighting benefits if we incorporate it in supplement form as well. Greek yogurt. Along with other probiotic-rich foods like kombucha, kefir and sauerkraut, Greek yogurt is rich in beneficial bacteria that bolster our immune system and may help reduce symptoms of the common cold – and just might help to prevent us from getting sick in the first place. Rainbows of produce. Mix up your veggie selections to include fruits and vegetables of all hues: anthocyanin-rich berries, red beans, red cabbage, beta-carotene-rich pumpkin, sweet potatoes, carrots, and lutein-rich spinach and kale are linked to a stronger immune system and a lower risk of the flu and the common cold. As always, check with your physician or healthcare professional before beginning any new supplement program. Vitamin C. Most research shows that vitamin C doesn’t prevent sickness, but that supplementing with 1,000 mg to as much as 8,000 mg of vitamin C may shave a day or two off of the common cold. 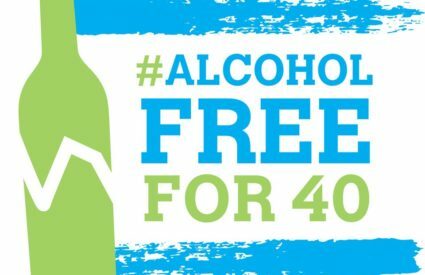 It’s nearly impossible to get that much vitamin C through food alone (an orange has just over 60 mg), so supplements are needed for these high doses. Vitamin C is available in capsule or powder form, and popular supplements like Emergen-C easily provide 1,000 per packet, along with the additional benefit of a dose of B vitamins. Vitamin D. Low levels of vitamin D are associated with a host of negative health issues, including increased risk of upper respiratory infections. Supplementing with at least 500-1200 IU of vitamin D daily can boost immunity, reduce our risk of the flu and help prevent the common cold. Elderberry Syrup. A tablespoon of elderberry syrup four times daily may help to reduce symptoms and duration of the flu when taken within 48 hours of initial symptoms. Locally owned Andi Lynn’s Pure & Custom Formulary also offers elderberry drops (the main ingredient in their PURE Immune Active Drops) for those looking for a lower-sugar alternative to elderberry syrup. N-acetyl cysteine. Supplementing with N-acetyl cysteine (600 mg twice daily) can increase our body’s levels of glutathione, a compound that plays a key role in immune system function, and has been shown to reduce the frequency, severity, and duration of the flu. 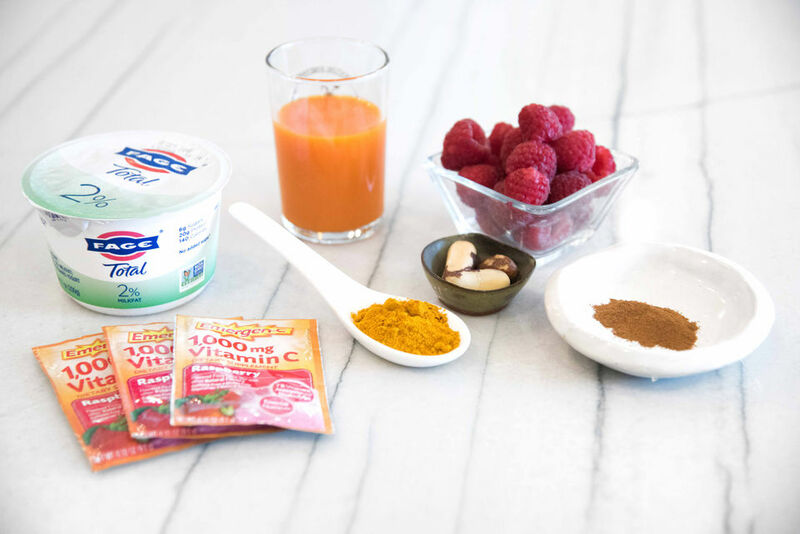 These foods and supplements can be a lot to fit into a day, so here are three ways to power up our soups, teas and smoothies to incorporate multiple cold and flu-fighting ingredients into one, making it easier than ever to sip our way to better health. Throat Coat Tea by Traditional Medicinals has ingredients like licorice and slippery elm that help to do just what its name implies: soothe sore throats. 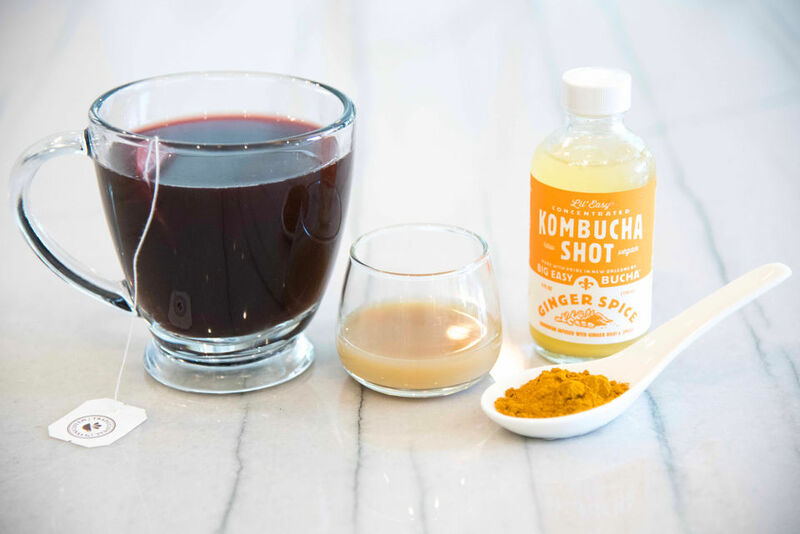 Rev up the cold-busting potential with an extra bag of turmeric tea, elderberry syrup, ginger and concentrated probiotic-rich kombucha – adding hot or warm water as needed to suit your taste preference. Heat elderberry, ginger juice and kombucha until slightly hot to touch. Add hot water to fill. Add both tea bags, steep and sip. 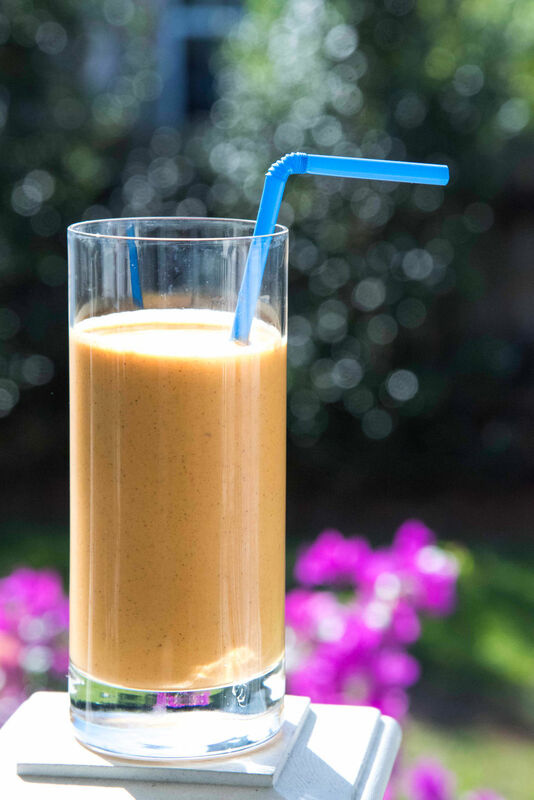 A hefty dose of probiotics, vitamin C, selenium and more are blended into this tart-and-sweet deep orange smoothie. Combine all ingredients. Add ice and blend. 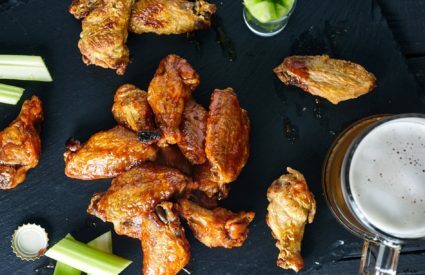 Per serving: 310 calories, 14 grams fat, 4.5 grams saturated fat, 150 mg sodium, 28 grams carbohydrate, 6 grams fiber, 15 grams sugar (0 added sugar), 19 grams protein. 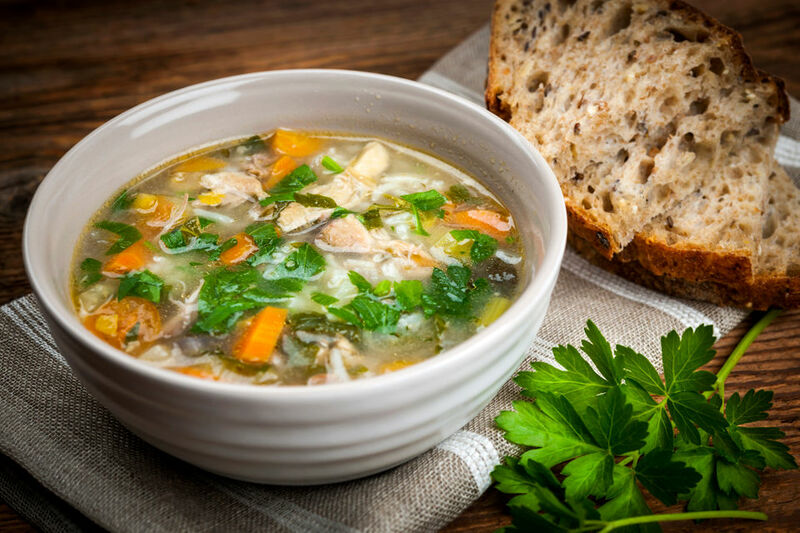 Take chicken soup to the next level by adding some of the top food sources of collagen, zinc and probiotics. In medium pot over medium heat, add olive oil and garlic and cook until garlic is soft. Add drained oysters. 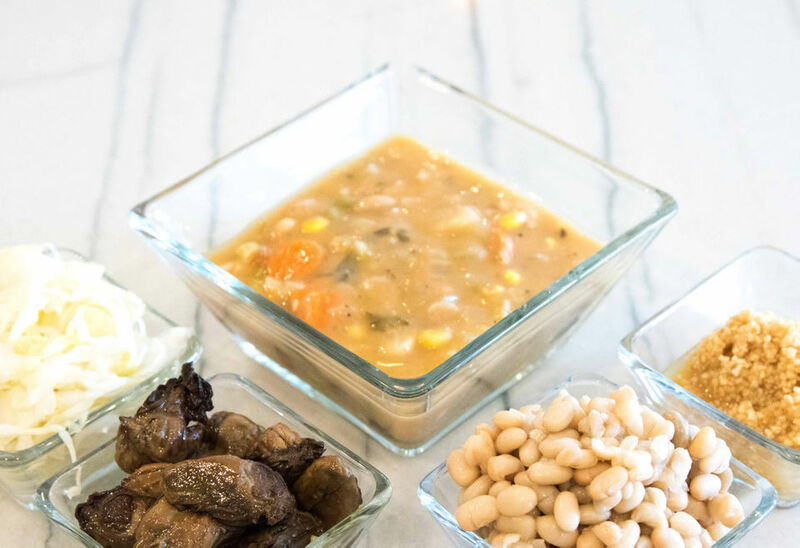 Once oysters are fully cooked, add white beans, followed by chicken and vegetable soup and bone broth. Cook until heated thoroughly. Remove from heat and stir in drained sauerkraut. Serve warm. 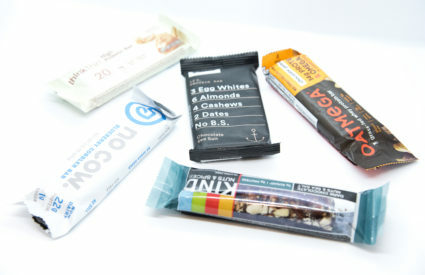 Per serving: 280 calories, 6 grams fat, 1 gram saturated fat, 360 mg sodium, 27 grams carbohydrate, 10 grams fiber, 1 gram sugar (0 added sugar), 31 grams protein.